Almost a decade ago, in the dying months of his premiership, Ehud Olmert offered Palestinian Authority President Mahmoud Abbas pretty much everything the Palestinians ostensibly seek from Israel. Hosting Abbas at the Prime Minister’s Residence in Jerusalem on September 16, 2008, Olmert took out a large map and specified the remarkable territorial concessions he was offering in a bid to partner the Palestinians to statehood and end the Israeli-Palestinian conflict once and for all. Olmert offered Abbas what amounted to 100 percent of the West Bank — with one-for-one land swaps enabling Israel to extend sovereignty to three major settlement blocs and the Palestinians compensated with territory inside Israel’s current sovereign borders. He rejected the “right of return” for millions of Palestinians to Israel — an influx that would doom the Jewish state — but indicated a willingness to meet the Arab Peace Initiative’s call for a just and agreed solution to the refugee issue, including a compensation fund and the symbolic absorption of several thousand refugees. Most dramatically of all, he proposed dividing Jerusalem into Israeli- and Palestinian-controlled neighborhoods and relinquishing Israeli sovereignty on the Temple Mount and throughout the Old City. Instead, said Olmert, the “Holy Basin” would be overseen by a five-member, non-sovereign international trusteeship, comprising Israel, the PA, Jordan, the US and Saudi Arabia. But miss the opportunity is precisely what Abbas did. He headed back to Ramallah, where he quickly sketched out his own map of what Olmert had proposed. Hours later, his chief negotiator Saeb Erekat called to say the Palestinians couldn’t meet as scheduled because they had to go to Amman, but would return for talks the following week. That never happened. 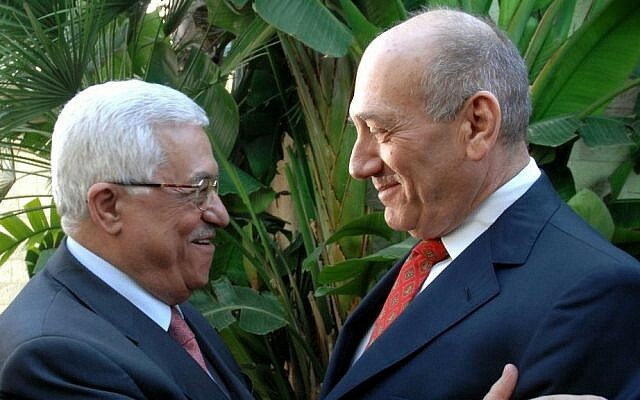 For years afterwards, Olmert would say sorrowfully that he was still waiting to hear back from Abbas. Unsurprisingly, Abbas made no mention of Olmert’s extraordinary peace proposal during his two-hour-plus anti-Israel, anti-Trump and anti-peace ramble before members of the PLO leadership in Ramallah on Sunday. Yet that appalling speech nonetheless provided the dismal explanation of why the man charged with leading his people to statehood had, nearly a decade earlier, rejected the best chance he would ever have to achieve that declared ambition. Out of Abbas’s embittered 82-year-old mouth came the truth: He himself believes the vicious propaganda disseminated first by his late and unlamented predecessor Yasser Arafat and then maintained during his own 13 years at the helm of the Palestinian Authority. The man whose doctoral thesis blamed Zionist agitation for the Holocaust, and disputed the number of Jewish victims, on Sunday set out a series of falsehoods obvious to the most casual student of 20th century events. He detailed a narrative that allowed no historic Jewish connection to this land — no Biblical history, no Temples, no ancient sovereignty. He airbrushed the Jewish nation out of its own past. Obviously, no leader so determinedly blinded to his enemy’s legitimacy could ever have agreed to reconciliation. Abbas’s public excuse for rejecting Olmert’s statehood offer in 2008 may have been “He didn’t give me a map.” What plainly motivated his rejection, however, was his insistent conviction that the Jews have no right to be here whatsoever. The tragedy is that first Arafat’s, and then Abbas’s, dead-end leadership affects us all. However inconvenient, the fact is that there are millions of Israelis and Palestinians — Jews, Christians and Muslims — between the river and the sea and we somehow have to find a way to live here together. The solution, as has always been clear to those who are prepared to open their eyes, lies not in some attempted quick diplomatic fix — trying to strong-arm the two sides into an accord on terms they do not want, against an artificial timetable they will not honor. Rather, the long path ahead requires education — education regarding the discomfiting fact that there are competing, conflicting claims to this land. Cognizant that the Palestinians are not going anywhere, and desperate for an accord that might liberate us from the choice of living by the sword or perishing, Israelis have shown a willingness — most dramatically represented by Olmert’s offer — for far-reaching territorial compromise. They have ousted prime ministers — notably Benjamin Netanyahu in 1999 — who they thought were missing opportunities for peace. The Palestinians, by contrast, have refused to acknowledge Jewish legitimacy, and convinced themselves that Israel is a transient, shallow presence that can ultimately be ousted. This, despite the spectacular evidence of our strong, resilient, thriving nation. A century ago, it was axiomatic in Islam that there were Jewish temples atop the Temple Mount; that’s why the Muslims subsequently placed mosques there. What Abbas’s speech so dismally underlined is that the false narrative of Jewish history that has taken hold in more recent decades is not only cynically disseminated by Palestinian leaders to their people, but also thoroughly accepted by the leaders themselves. The UN can vote itself blue in the face against Israel. Foolish nations can unilaterally recognize Palestinian statehood — to the detriment of the Palestinians, since such “support” merely deepens their obduracy. But the only route to Palestinian independence runs via a negotiated settlement with Israel. The Olmert offer of a decade ago showed how far Israel was prepared to go to partner the Palestinians to statehood. The despicable, tragic, self-defeating Abbas speech of Sunday night showed that so long as the Palestinians blind themselves to the fact of Israel’s legitimacy, no Israeli offer is going to be good enough.